Education is a big investment, and many students like you may need help paying for it. The price of tuition alone may seem like a barrier between where you’re at now and where you want to be. Even then, tuition isn’t the only expense you might face—the cost of textbooks, housing, transportation, food and supplies all add up. This is why most students utilize some form of financial aid, including private student loans, to help them fund their future goals. Let’s take a look at the main sources of financial aid to gain a better understanding of your options as a student. Financial aid usually comes in the form of grants, scholarships, federal loans or private loans. You may choose to use a combination of these to get the financial help you need. 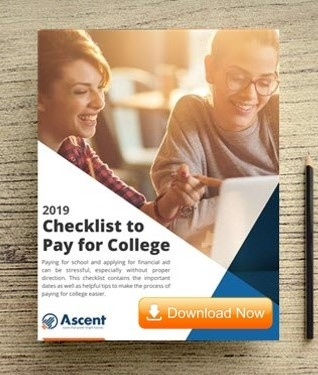 The Free Application for Federal Student Aid (FASFA) will be your starting point when it comes to receiving financial aid. You may be awarded grants or subsidized federal loans based upon your financial need. In order to determine how much financial assistance you need, you may be asked to provide information about your parent’s income and education levels. Remember that you will have to re-submit the FAFSA every year to claim your benefits, just like you do for grants and subsidized loans. Check out the FAFSA deadlines to make sure you turn yours in on time! Grants are awards that do not have to be repaid. As you can imagine, these are welcome bonuses for students! Grants can be awarded based on merit or on need, usually by the state or federal government. Some grants are competitive in nature while others are student-specific. The most common type of grant for undergraduates is the Pell Grant, which is awarded based on financial need. Other grants are more specialized, such as the various grants available for minority students. To check out some of the types of grants out there, have a look at The College Grants Database. Scholarships are similar to grants in that they don’t have to be repaid. Unlike grants, scholarships are usually offered by private institutions rather than the government. They are awarded based on factors such as scholastic performance in school and athletic skills. The financial aid office at your school can help you out with finding scholarships. For more info, check out BigFuture’s article on where to find college scholarships. Subsidized federal loans provide some relief for students who have demonstrated financial need. They may include deferred payment plans, which allow you to hold off from making payments on your loan for a while. The main benefit of subsidized loans is that the Department of Education will pay the interest on the loan while you are in school. This means that essentially your loan is interest-free while you’re in school. With a subsidized loan, if you borrow $1,000 as a freshman, you’ll still owe just $1,000 when you graduate. Unsubsidized loans do not offer interest relief. The same $1,000 you borrowed as a freshman may be $1,500 when you graduate due to the accrued interest. The benefit of unsubsidized loans is that they are available to borrowers, regardless of financial need. Federal loans are often the first option for students; however, they do not always cover all of a student’s needs like a private loan might. Private loans help to bridge the gap between these last three forms of financial aid and your education. We’ll dedicate the rest of this article to understanding how a private student loan works, and how it can be an important factor in making college work for you. Would this loan cover all of my tuition and living expenses? Having a loan that only helps with tuition won’t support the cost of books and living expenses. Sure, education is important, but we still have to eat and have a roof over our heads! Is it customizable to suit my needs? Everyone’s situation is different, so there’s no one-size-fits-all approach. Working with the right loan provider can help you craft the perfect plan. What are the interest rates—are they affordable? Interest rates determine how much the loan costs to take out. They come in the form of either a fixed or a variable annual percentage rate (APR). A variable APR follows an index, such as in the stock market, that fluctuates over time. A fixed APR is not attached to an index and stays more consistent. Your loan provider will help you determine whether a fixed or variable APR is right for you. Are there any additional bonuses? Some providers will offer additional incentives for students. It’s a good idea to take advantage of these bonuses if you can find them. Look for plans with bonuses, such as cashback graduation rewards. Once you decide on a loan provider, start the application process. You can speed along the process by swiftly providing any and all information requested by the provider. For many loans, you’ll be required to have a cosigner. A cosigner is someone who is backing up your side of the loan. They assume liability for the loan in the event that you do not make good on payment or contractual obligations. Usually a parent or relative, they lend their credit score and income as insurance for the lender. This means that if you were to default on your loan, your cosigner would be responsible as well. Having a cosigner can help you get lower interest rates as well as other potential benefits. In some cases, you may want to release your cosigner after a period of time, since it offers you an opportunity to gain independence down the road. It’s important that you consider all of your options when it comes to choosing a student loan. Loan amounts, interest rates and eligibility requirements all have to be taken into account to make the best choice possible. Some loans, such as the Ascent Tuition loan, may offer benefits to those who have a cosigner. Once you have secured the college funding you need, you’ll be one step closer to graduation. Next Do You Need a Job as a Full-Time College Student?